Okay, so there’s no real race. There hasn’t really been any this year, but that’s really beside the point of this post. I’m just using that cliched saying about how I’m approaching my workouts, especially lifting. A few months ago, I wrote the post It Doesn’t Have to Be That Way, which just highlighted that I don’t have to be all or nothing. With a knee that isn’t fully functioning, you can’t really expect to be doing things that a regular knee could do. It’d be just a little over a year since I randomly hurt my knee during my last soccer game of the 2016 season. I vividly remember the step I took that caused the injury. A wrong misstep, a few doctors appointments, an MRI, an Xray, and a handful of physical therapy appointments later and still undiagnosed. October 2017 was my fourth anniversary at Midtown Strength and Conditioning. Someone recently asked me how long I’ve been there and I’m pretty sure I accidentally lied and said five years. Here is a post that I wrote to celebrate my third Midtown anniversary, prior to my injury. Everyone seems to be obsessed with PRing. I mean, I get it. It’s great to lift heavy weights that you’ve never lifted before. But I have questions. Does a PR count if you wear a belt? Does it count as a squat PR if I used a box? I didn’t want to push my luck with my knee, so I babied it with box squatting. Now that we have those questions out in the air, I always track my numbers and indicate if I wore a belt or not. I keep them separate. Maybe I’m doing it wrong, but that’s how I’m doing it until someone answers my lingering questions. To keep me humble and accountable, I wanted to share my recent lifts and hopefully be able to look back in a year and see some improvements. I’m basically starting fresh again, since just recently I started ditching the box for squats, doing full movements (not just the power options), and going for depth instead of babying my knee. It’s been a little scary and I’ve taken it really slow, but I love seeing the progress. I’ve been using a small box for burpees and just this week, I gave it a go with full burpees. They aren’t without a tinge of pain yet, but I’ll scale if and when I need too. I’ve also started incorporating box jumps again, but I’d like to reiterate, s l o w l y. Alternating jumps and step-ups mostly. I’m no serious weightlifter, but I think numbers are decent for a recreational lifter. And I won’t qualify it by saying ‘for someone with a knee issue.’ You won’t see any updated squat numbers since I haven’t been attempting to max out lately. It hasn’t been on Milo’s program lately, but we mix them in throughout the workouts, just not maxing out. However, we’ve been going heavy and then adding bands to add even more weight. This has been fun but left me really sore afterward. Overall, I’m in a really good place when it comes to Midtown. Monday, Wednesday, and Friday are for Milo’s Strength program. Tuesday, Thursday, and Saturday are for conditioning programmed by Milo too. I don’t go at 5:30 AM anymore, so I don’t get to experience the fun hell of Bobbie anymore. Sunday’s were for soccer, but that has ended until the new year. I’ve been adding in short runs and spin class from time to time as well. I’ve been enjoying throwing on my lifters and really focusing on my technique. I know my numbers are a work in progress and I have no desire to compare myself to anyone. But being surrounded by extremely strong men and women make it hard not to compare yourself. So, I am constantly reminding myself that I am competing against just myself. No one else. 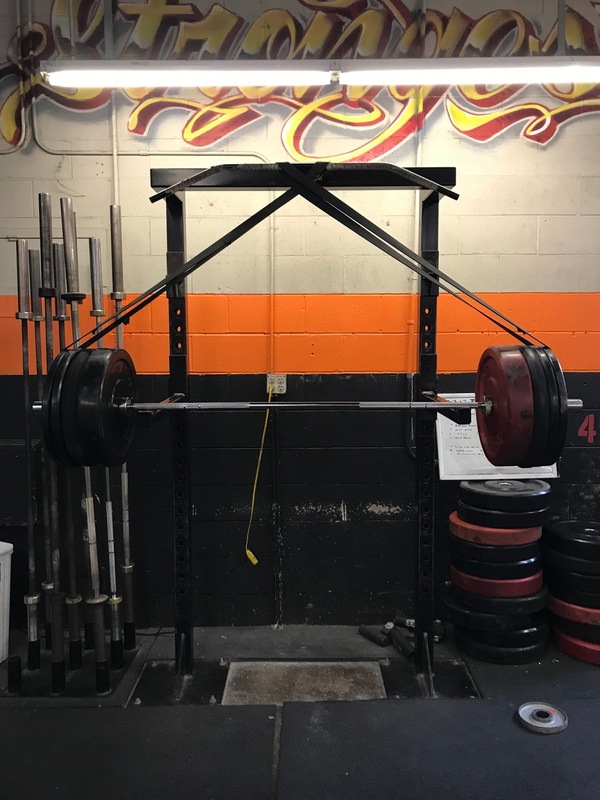 The weight on my bar is the only thing that matters, well technique, technique matters more than the weight on the bar. I’m grateful to be a part of Midtown, where between the joking and laughing the support is even stronger than anything else. It’s really weird because although there are standard classes throughout each day, I don’t generally work out with anyone else. I grab the board for the day and get to work. The ‘board’ is just a whiteboard where Milo writes his workouts for the day. Sometimes there are options between strength or conditioning too. I could also jump in a do a WOD, but that rarely happens. Sometimes, I do a partner WOD if Jen coerces me 😉 Although I love the camaraderie, I’ve learned that I can excel at solo workouts too. I try to remind myself to push the weight and get the form, but there are the days where I go slower than I would if I was working with a class. But, for the most part, I’ve enjoyed the freedom to come and workout when I want. There are always coaches around to ask if I have a quick question OR I just google it. Because, for the life of me, I can never remember what power means. Milo is also known to throw in something random that I’ve never done before too, re: Sotts Press?! More than listing out my lifts and weights, this post is really self-reflection on my progress. It’s my way to be proud of what I’ve been lifting, but also recognize my mental deficiencies and work through those. The mental part is just as important as the physical journey too. Getting to the gym is more than half the battle on most days, but realizing you’re staying consistent is much more satisfying!